Just because hunting has been around for 90 percent of human history doesn't mean that it will be around for the next 50 years. We cannot take our rights for granted. Preaching to the choir will not save hunting; we must influence others outside our circle to further our message. Whether you mentor your own children or grandchildren, nieces or nephews, or just a family friend or neighbor, you can do your part in passing along your knowledge and enthusiasm to another generation of hunters. Taking someone hunting just once could be life-changing for that individual — and you'll never know whether they're interested if you don't ask. My own kids are too young to take hunting at this time, but I still bring them along when I'm scouting for sign or checking trail cameras. They enjoy the time spent with Dad and are gaining an understanding of the connection between the outdoors and the food on their plates. Can't find a kid in your area to mentor? You can become a digital mentor through an app called "Powderhook." The app allows new hunters to ask questions and gain insight through anonymous interactions with more-experienced mentors. In just a few minutes per week, you can help guide the next generation. This free app is made possible through a partnership with Cabela's Outdoor Fund and Pass It On — Outdoor Mentors and can be used on your iPhone, iPad, iPod Touch, or Android device. When Americans left the farms and the small towns for the cities and the suburbs, we lost entire generations of hunters. Not everyone has the real estate to teach a child how to shoot a firearm, but almost every living arrangement allows for archery. Thanks in part to the influences of popular culture, archery has seen resurgence among America's youth — capitalize on that popularity by mentoring a young boy or girl as an archer. Youth recurve bows sell for less than $50, and archery basics can be taught in tiny suburban backyards, public recreation areas, and even indoors. My friend turned his small backyard in crowded Southern California into a 3-D archery range and raised an outdoors-obsessed huntress as a result. 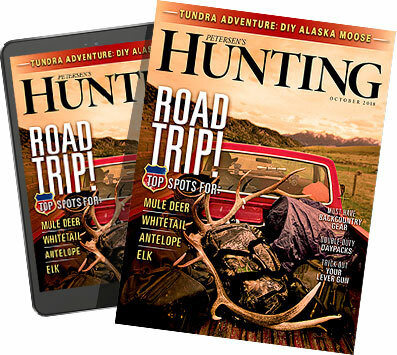 What better way to introduce young Americans to hunting than by taking the family on a hunting vacation in one of our nation's wild public lands? We live in one of the few nations on earth where the people own much of the hunting land. Load up the kids and spend a few days camping and hunting in a backcountry wilderness area. No matter where you live, there's a spot within a day's drive. Take your kids where their phones don't work and show them what it's like to live off the land, to make a fire, to hunt and fish for dinner. Sitting around the fire is an ideal time to teach them how our public lands came to be. It will be an experience they'll never forget. Generations of Americans first learned to shoot in youth programs offered by NRA, 4-H, or the Boy Scouts of America. Quality shooting instructors will ensure that new shooters find success quickly, which drives the enthusiasm to continue learning. Teaching the next generation of hunters to handle firearms safely and kill game cleanly are among the noblest of goals. Completing one of the many NRA instructor certification programs offered across the country is a great step — qualified instructors are always in-demand. To this day, I can remember the lessons taught by my hunter education instructors more than 25 years ago. Those volunteers made a positive impression on me and taught principles of hunting safety and ethics that I still apply today. Nearly every state has some sort of hunter education requirement, and many states have a limited number of training sessions that fill up quickly. In order for would-be hunters to participate, we need to ensure that hunter education does not become a barrier to access. Volunteering your time as an instructor will help shape future generations and will help ensure that new hunters are not lost due to a lack of available classes. Raise your hand if you have an old bow, pack, or hunting jacket that is collecting dust. Not only is that gear doing you no good sitting in your closet or garage, but also it's not doing anyone else any good, either. To a young person looking to get into hunting, your bow from 2005 could be the difference between tagging a deer and staying home this fall. Ask around town or at work to find a worthy individual or put an ad up on the sporting goods section of craigslist. Hold a mini essay contest via email to pick the best candidate. If they're too lazy to write a paragraph on why they're deserving of your free gear, keep looking. We talk a lot about getting access to private lands, but we rarely mention the act of repaying that landowner's kindness and generosity. Keeping a piece of land maintained as viable hunting habitat is a time-consuming and costly exercise that is probably appreciated by few who haven't done it. Helping that landowner with year-round land improvements is a good way to ensure access to the property, and it teaches the next generation of hunters respect for the hard labor that goes into land ownership. Helping the landowner maintain fences, plant supplemental feeding crops, or simply spraying for weeds can go a long way in changing the land-owning public's perception of hunters. Whether we like it or not, hunting and gun ownership have become inextricably linked to public policy. If our children and grandchildren are to be afforded the same hunting opportunities as we have now, they must understand the importance of voting their sport. Passionate and articulate hunters who can be good ambassadors to politicians and the non-hunting public are our best tools against the erosion of our rights. Before the next election, sit down with your child and research the candidates' positions on hunting-related issues, including gun rights, access to public lands, and conservation topics. Help a young person craft a letter or an email to an elected official and urge them to support a pro-hunting or conservation cause. When I worked for NRA, the most common complaint I heard from the shooting public involved a lack of accessible and safe places to shoot. Many of the public ranges around the country are abused and neglected by inconsiderate shooters who shoot up signs, leave trash on the range, and show a lack of appreciation and respect for the range. Taking a group of young people to clean up a shooting area not only helps mitigate the damage done by the mouth-breathers, but also teaches the next generation to preserve and respect our public lands, which will help ensure continued access for shooters. New hunters need to understand that the hunt starts long before the season begins. The single most important thing you can do to influence aspiring hunters is to walk the walk yourself. Be ethical, be respectful, be enthusiastic&apos;¦be the kind of hunter that will inspire others to seek the outdoors themselves. We can't expect fair treatment from the media and popular culture, so we shouldn't do the other side's work for them through our own irresponsible conduct. be an effective outreach tool but only if used appropriately and responsibly. Is your social media post going to attract prospective hunters or turn them away? Use these tools to be an inspiration to the young hunters you may touch without even realizing it.